The new Veloster's roofline has been lowered. This gives it a more unique profile with "distinctive, coupe-inspired essence," the automaker said. DETROIT -- Hyundai is reviving its Veloster hatchback for the 2019 model year with a new platform and the brand's first-ever N performance model for the U.S. market, along with a more muscular design akin to a sport coupe. The brand unveiled the 2019 Veloster along with its turbo variant at the Detroit auto show on Monday. The Veloster begins production in March in Ulsan, Korea, and will be available in the U.S. in the second quarter of 2018. Hyundai decided to not build a 2018 model-year Veloster while it prepared for the next-generation model; its sales declined 58 percent to 12,658 units in 2017. The new Veloster's roofline has been lowered. This gives it a more unique profile with "distinctive, coupe-inspired essence," the automaker said. The rear has a more aggressive integrated diffuser design. The base Veloster has a 2.0-liter four-cylinder engine that generates 147 hp and 132 pound-feet. Transmission options are a six-speed manual or a six-speed automatic. The turbo model's 1.6 liter four-cylinder engine produces 201 hp and 195 pound-feet of torque. A six-speed manual or seven-speed dual-clutch transmission are available. The N version sports a turbocharged 2.0-liter 275-hp engine with 260 pound-feet of torque, a six-speed manual transmission18- or 19-inch wheels and special N badging. 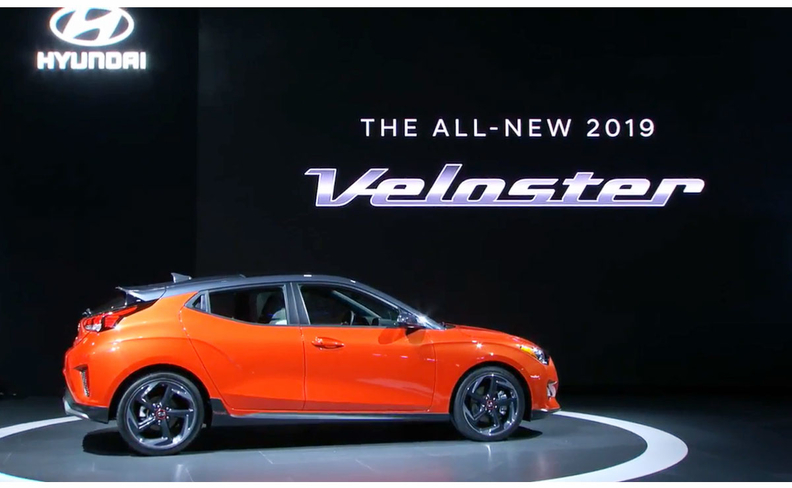 Mike O'Brien, vice president of Product, Corporate and Digital Planning at Hyundai Motor America, said in a statement: "When combined with Hyundai's outstanding value and efficiency, the new Veloster is sure to attract a progressive new group of enthusiast buyers."